If you’re seeking some good Husky training tips, it’s a good idea to know where you should start. Understand what your Husky needs from you in each training situation and learn what you should give to him. Many owners expect their Husky to think just like them. What’s really happening is your Husky simply reacts to what you do and say. He wants to be accepted as part of the “pack” and may not understand everything that you expect from him. Many people forget that their Huskies are still animals with animal instincts. If you want to overcome any negative behaviors, the best approach is NOT to scold or yell at him, but to focus on changing how they express such instincts. The following few tasks can make Husky training much easier. Crate Training – Not only does crate training provide your dog with a home that he can retreat to, most Husky training tips will state that a crate will make potty training that much easier, as well as reduce excessive barking and anxiety issues. Never use a crate as punishment, and spend time at home with your Husky in the crate to allow him to more easily adjust to it. Leash Training – If you have problems with your Husky on a leash, the best thing to do is to teach him to reach a controlled and calm state. A controlled state will allow him to respond to your commands without getting overly excited about an anticipated walk. The majority of Huskies that have leash issues were simply allowed to run around and pull on the leash. Any time your Husky pulls on the leash, have him sit and wait beside you before you start walking again. He will start to associate pulling on the leash with a halt of the walk. 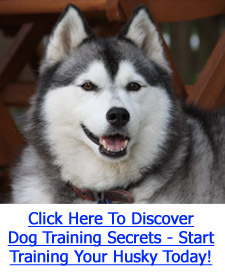 Obedience Training – Some of the best Husky training tips that you can get come from obedience classes. Obedience classes educate dog owners on how to maintain alpha leadership throughout the household, how to display control over a new puppy, and how to give commands authoritatively. If you have a new puppy or are having trouble with controlling an older dog, you may want to consider taking obedience classes as a supplement to home training. One thing that all Husky training tips agree on is the need for consistency. Huskies are intelligent, but much of what they learn is largely from response to repeated conditioning in a consistent environment. If you set a rule for your Husky, make sure that everyone in the house knows about it and is also consistent with it. For example, if you are trying to make your Husky sit for his food, have him sit every time and not only when you have the time to give the command. Not being consistent with a rule will just confuse your Husky and he will likely stop following your commands. Good Husky training is difficult and time consuming, but is extremely rewarding.